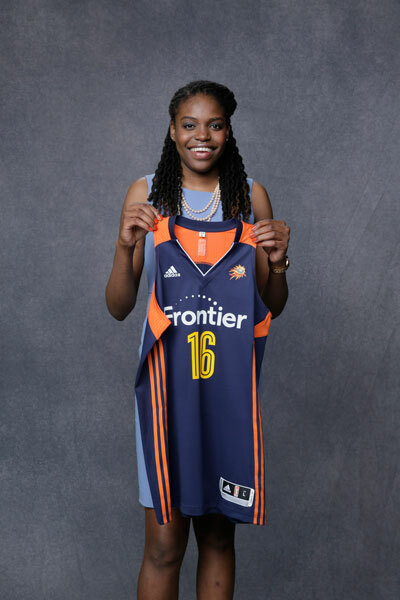 Jonquel Jones poses with her new Connecticut Sun jersey after the WNBA draft last Thursday. Two days before the WNBA draft, senior forward Jonquel Jones remembered a moment from her childhood in the Bahamas – watching women play professional basketball on television for the first time. Now, 15 years later, Jones will be one of those women. On Thursday night, she was selected sixth overall in the 2016 WNBA draft by the Los Angeles Sparks and soon after was traded to the Connecticut Sun. Jones said she was proud to represent GW at the draft because she felt like the team had been overlooked during her collegiate career. Fewer than 30 minutes after the selection, Jones was traded from the Sparks, a team with star power in Jones’ position, to the Sun, a roster where she might find a more solid chunk of playing time. The Sun sent second-year former Duke guard Chelsea Gray to Los Angeles along with their second round pick (15th overall), third round pick (23rd overall) and their first round pick for next year. In return, Connecticut received the rights to Jones and the Sparks’ second round pick (17th overall). Jones is now the sixth player in GW history to be drafted into the WNBA and the first since Jessica Adair in 2009. The sixth overall selection also makes her the first Colonial ever drafted in the first round and the highest A-10 selection since former Xavier forward Amber Harris was selected fourth in 2011. In her final season as a Colonial, Jones led the nation in rebounding (14.6 rpg), ranked fourth in the A-10 in points per game (16.2 ppg) and landed second in the A-10 for blocked shots (3.3 bpg). In each of her three years at GW, she was the only player in the conference to average a double-double. The 6-foot-6-inch forward is joining a Sun team that has been struggling but improving over the past two seasons. After only racking up 10 wins in 2013, they finished the 2015 season in last place in the east going 15-19. Along with Jones, the Sun picked up UConn junior forward Morgan Tuck (3rd overall) and Minnesota senior guard Rachel Banham (4th overall) in the first round. The Sun finished second to last in the league for rebounding in 2015 but come into the new year with a stacked front court. On top of Jones’ size and athleticism, they return with last season’s leading scorer center Kelsey Bone and forward Chiney Ogwumike, who missed the entire year with a knee injury. Bone recorded 15.4 points and 6.3 rebounds per game last year, while Ogwumike led the 2014 Sun team with 15.5 points, 8.5 rebounds and more than a block per game. Jones’ fellow Bahamas native and childhood friend Oklahoma senior guard Buddy Hield is also gearing up for the men’s draft in June. Since Hield is expected to be a top five pick in the NBA draft, Jones joked about the competition they had about who would get drafted earlier. Fewer than two weeks after draft night, Jones and the rest of her Sun team kick off training camp on April 24 to get ready for the season beginning on May 14.